My Nail Polish Storage Solution! Recently I have noticed I have quite an obsession with nail polishes and my glossy box I was using was jam packed full and all messy which drove me mad. I wanted a cheap but effective way to store them without having to hide them all away. I have to say this though, I may need a second jar.. I am loving the Barry M Gelly nails at the moment, they are amazing quality and come in the best colours. My favourite at the moment has to be Dragon which is the light pink in the second photograph. I went into Pound Stretcher due to a new one being opened where I live and found that it has so many house hold goodies for the kitchen and lots of other things. I found this jar in the kitchen area and decided I was going to use it for my nail polishes. I love how it looks in my room and you can see them all. I hate hiding them away in a cupboard, now this may make me use more colours. I tend to stick to pastel shades, anything pastel I will love. You can re use these jars for so many things, you don't have to use them for the kitchen. I love glass jars though, i even buy small ones to put flowers in them. It creates something different for the home. I will be putting up some more nail polish related blog posts soon, so keep an eye out for them. 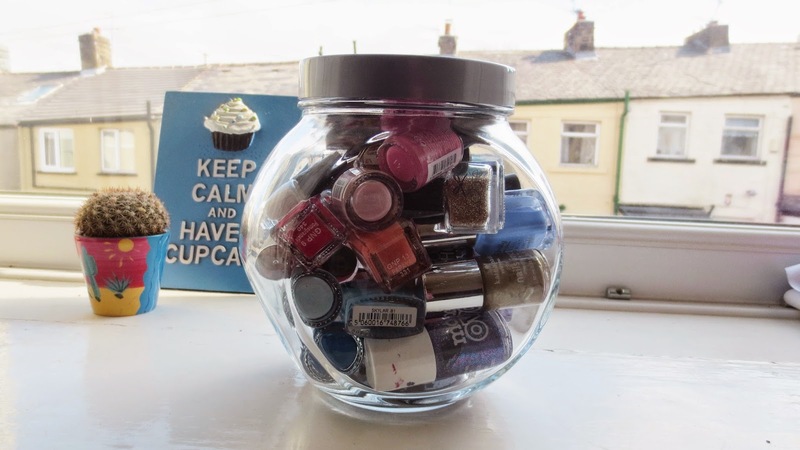 I am so pleased i found this jar, its a bargain, it makes my nail polishes stand out and they look neat. 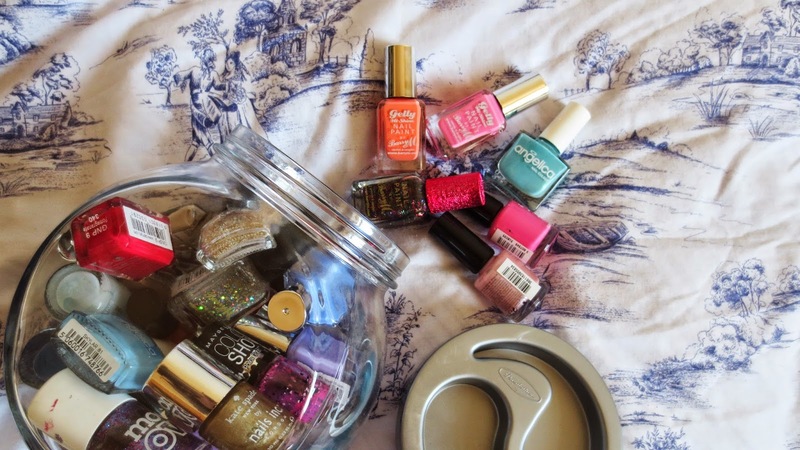 How do you store your nail polishes or beauty products, let me know or do you know any cute DIY tips for the house? Such a smart idea! Love this post :) Definitely going to be coming back for more!